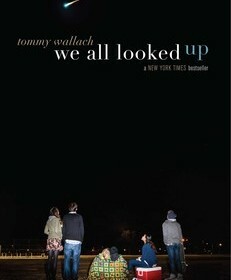 In We All Looked Up, by Tommy Wallach, an asteroid named Ardor is headed towards earth, it will cause sudden death for all, and throws society into chaos. A group of teens go against the grain to live. Peter, the smart talking basketball player, Eliza, the photographer with a blog to show the world, and Andy, the skate punk rocker who creates anarchy along with his best friend Bobo, are the most unlikely to develop a friendship. With the asteroids impending approach the teens find themselves breaking free of their labels and seeing the world for what it is, a mess. The teenagers soon learn how to live the way they want, burning down Targets, skateboarding through malls, and pushing all their fear away. Peter risks his life to save his sister from the dingy room of Bobo’s apartment, as Bobo falls into insanity. Eliza falls for the player and will loose her new friends to receive his heart. Andy will do anything to take his mind off of the impending doom. The bitter end for humanity nearing does not seem to bother Bobo and his ‘friends’ as Andy hangs in the back not sure of what he thinks. Andy tries to have fun with his friends, he tries to go back to his anarchist ways, but all he can think is We will die. I would recommend this book to more mature readers because of the use of vulgar language. I would also recommend this book to people who enjoy cliffhanger endings. I enjoyed how Wallach explained the details of the different settings giving the feeling of being in the moment right there with the characters. I dislike how the characters point of view switched around a lot every chapter. One chapter it would be Andy’s point of view then in the next chapter Eliza’s point of view focusing on something completely different. Wallach was able to make the characters their own people, the feeling of fear, the angst, and the desire to really live.